Having got the hang of the basic technique, I’m now trying to extend my range. 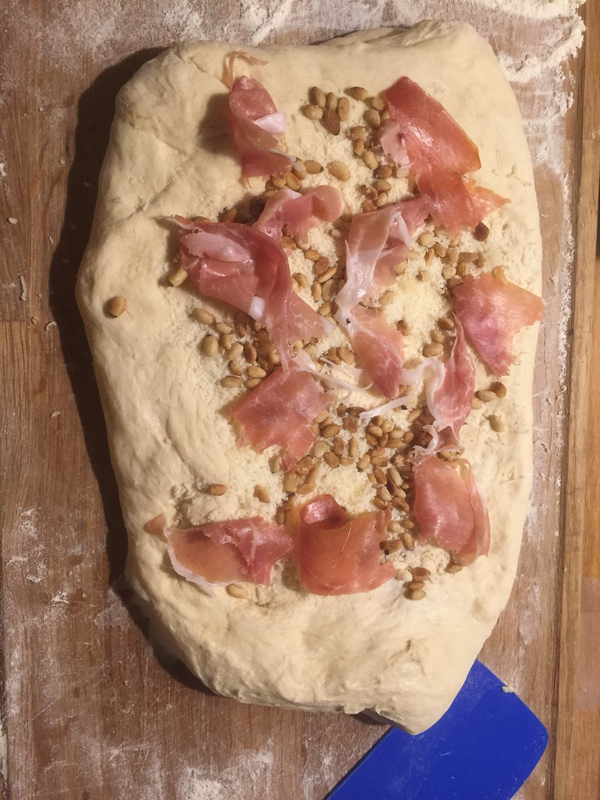 This was the first time I used rye. 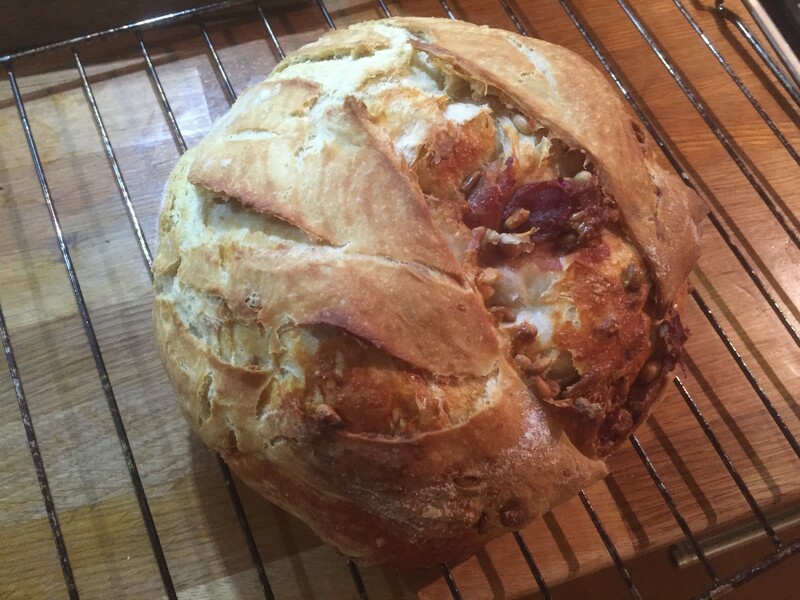 Great crust colour and flavour – and it made a change to bake a ciabatta. 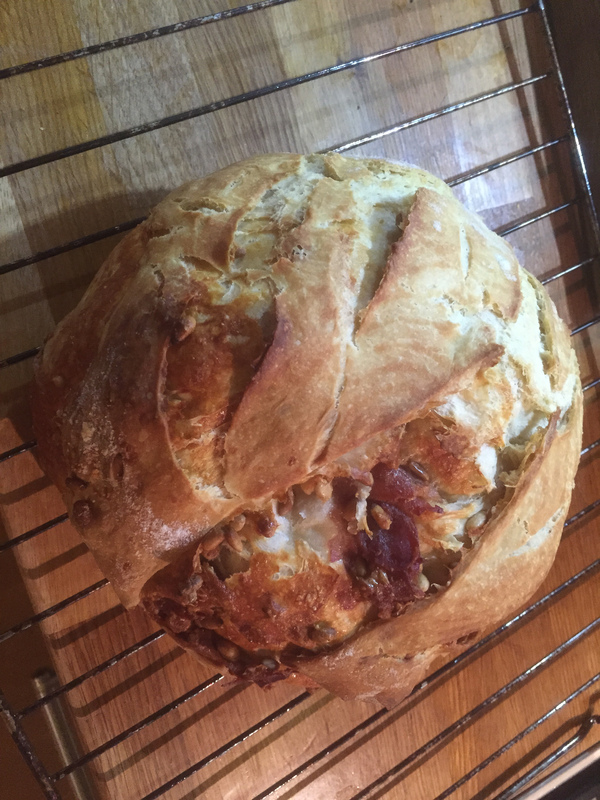 This was the same recipe, but baked as a boule. I can’t recommend Richard Bertinet’s books Dough, and Crust enough. 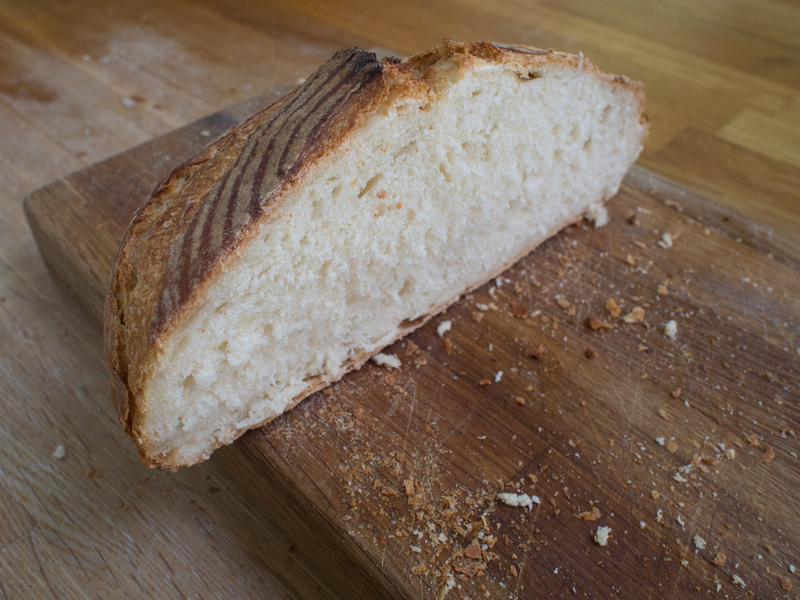 Rory, my youngest son is three, and he’s not that keen on the texture and toughness of sourdough so I tried a couple of loaves of yeasted white bread. 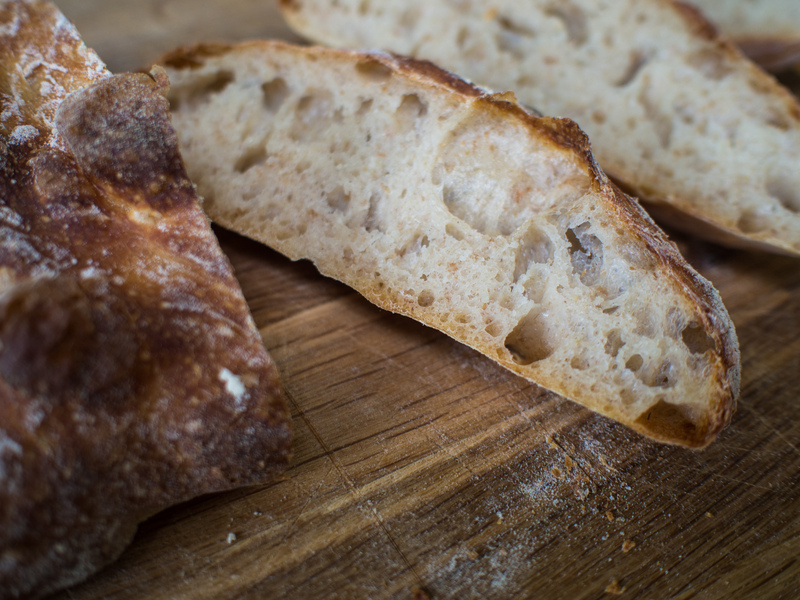 The first was very traditional, very light crumb – and made amazing toast. 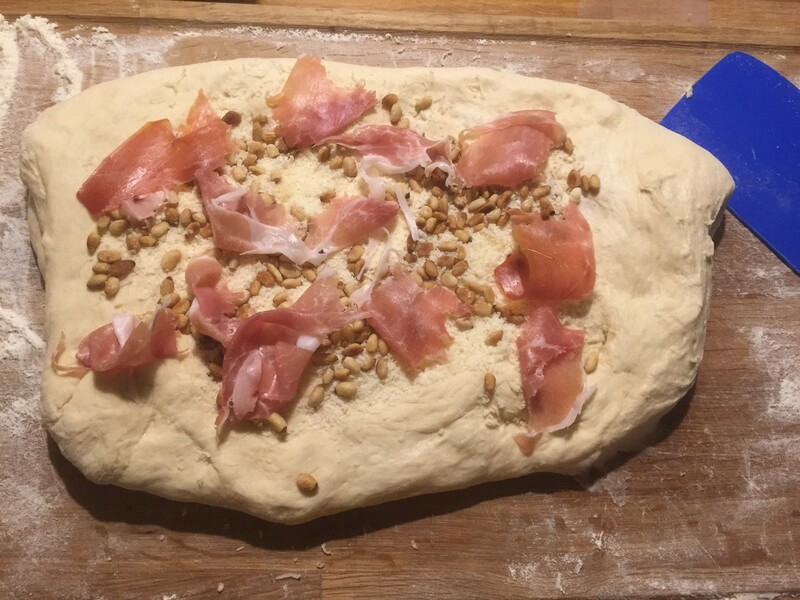 The second was a Sunday Brunch loaf made from olive dough, adapted from his “Parmesan, Parma Ham & Pine Nut Slices” recipe. 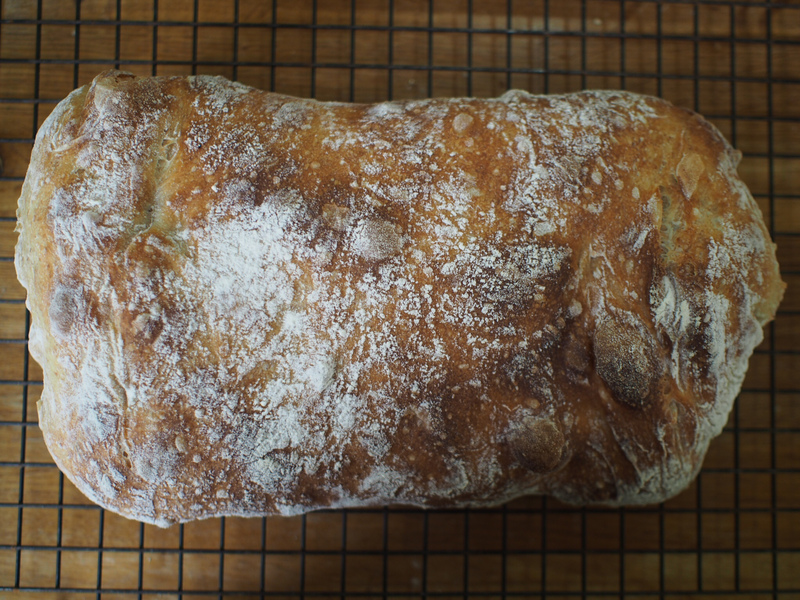 Instead of making them into what he calls “savoury pain aux raisins”, I just made a traditional boule. Once cooled, I toasted thick slices and then served with a poached egg on top. Full English Breakfast. Kinda. 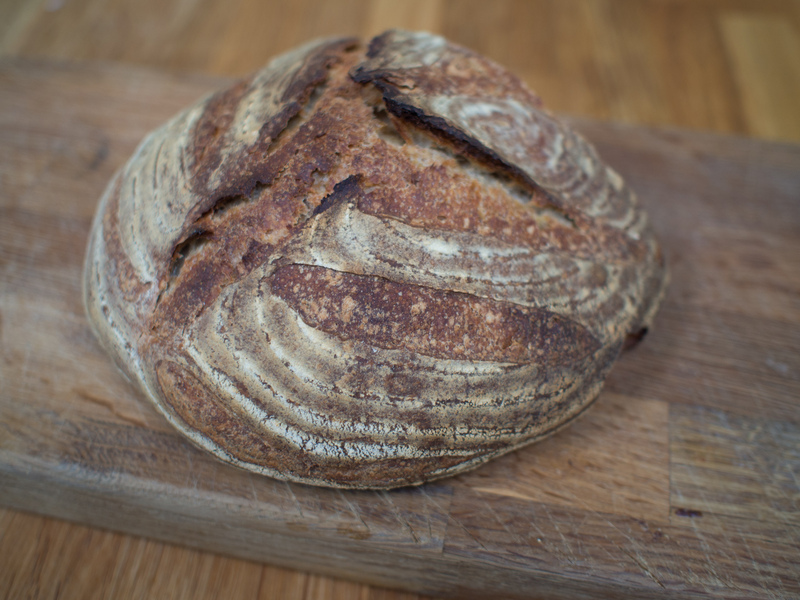 Having reduced the prep time to around 15 minutes per loaf, and with ingredients costing around 50p per loaf, we’re now happy to eliminate shop-bought mass-produced bread. 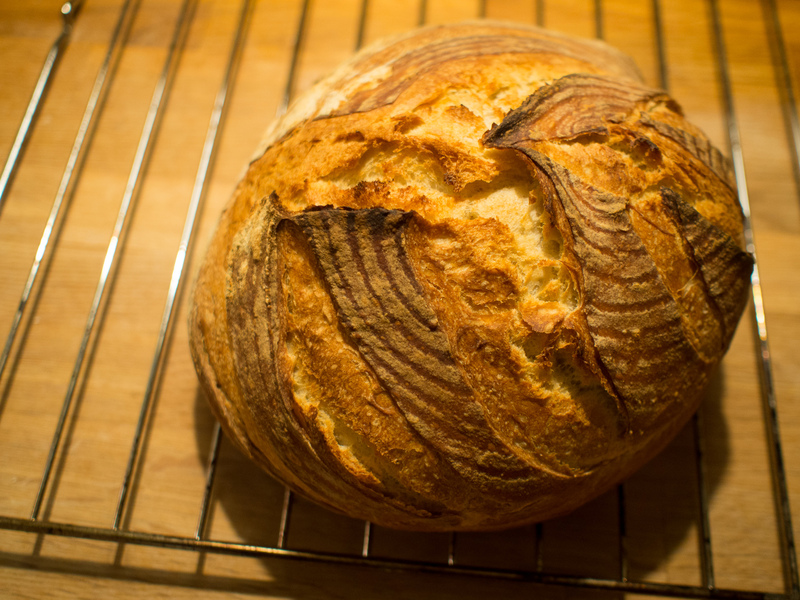 But the lead-time for a sourdough loaf is 24 hours so I want to bake and then freeze a couple of weeks’ worth of bread. 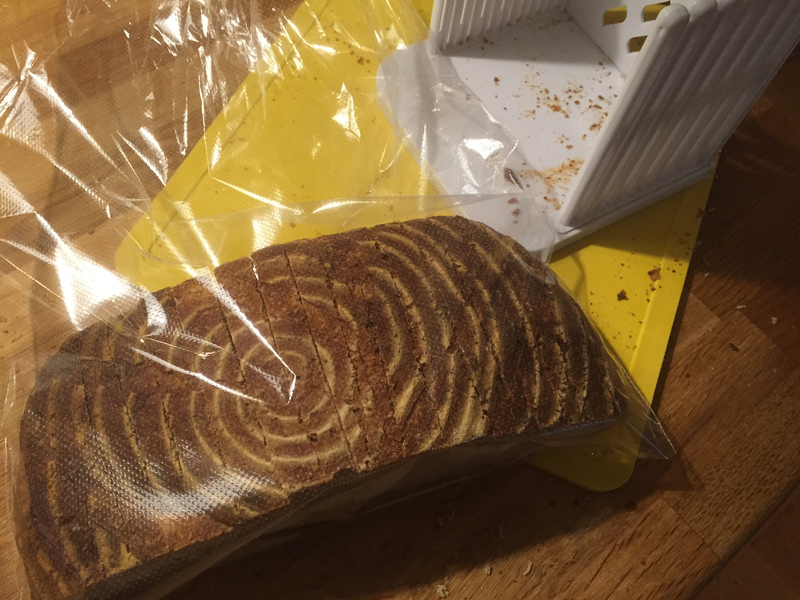 A quick trip to amazon and a few quid on a slicing guide and some perforated bread bags, and the production line is ready to roll. 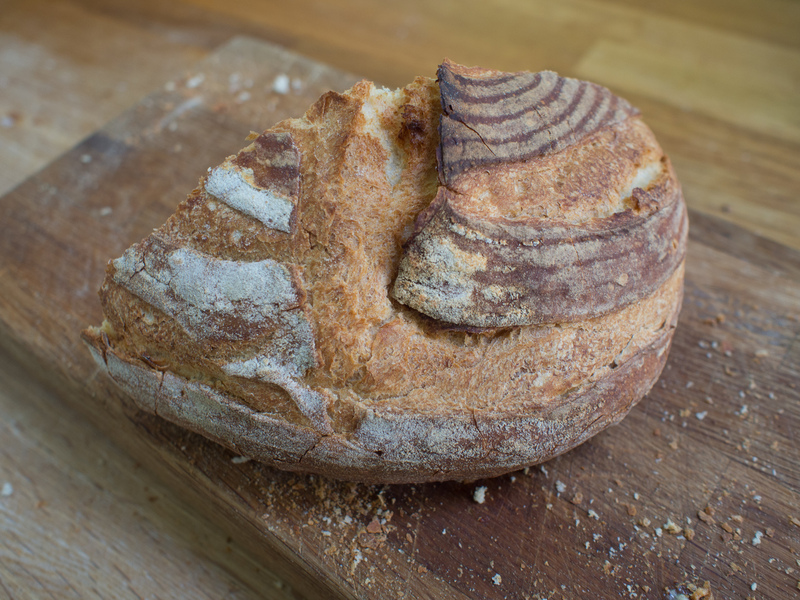 This golden loaf was my first use of spelt, displacing around 10% of the strong white flour. 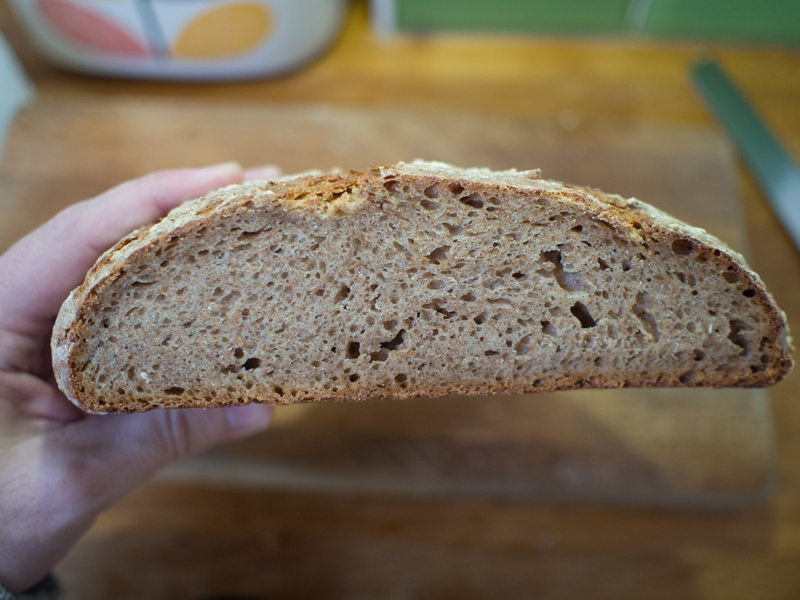 Still produced a nice open crumb, but with a nuttier flavour and a much darker crust. 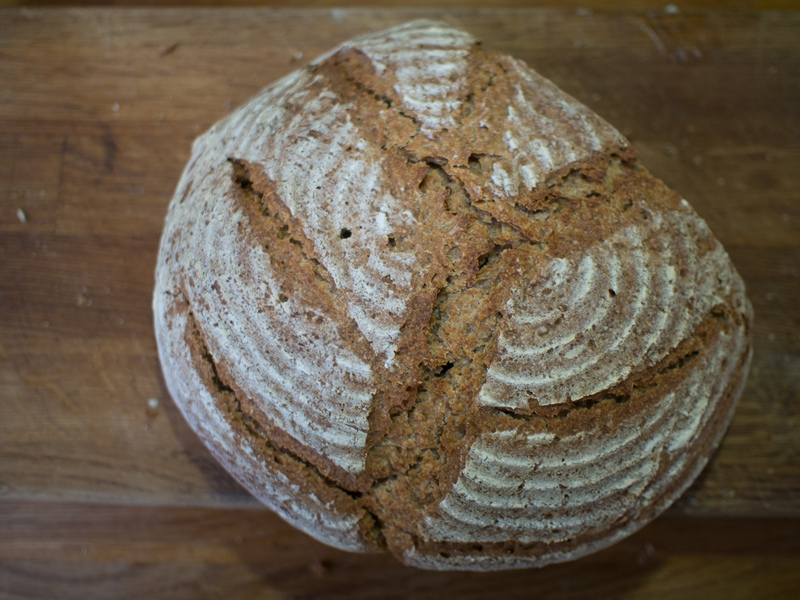 Whereas this loaf was 1/3 white flour, 1/3 spelt and 1/3 rye. 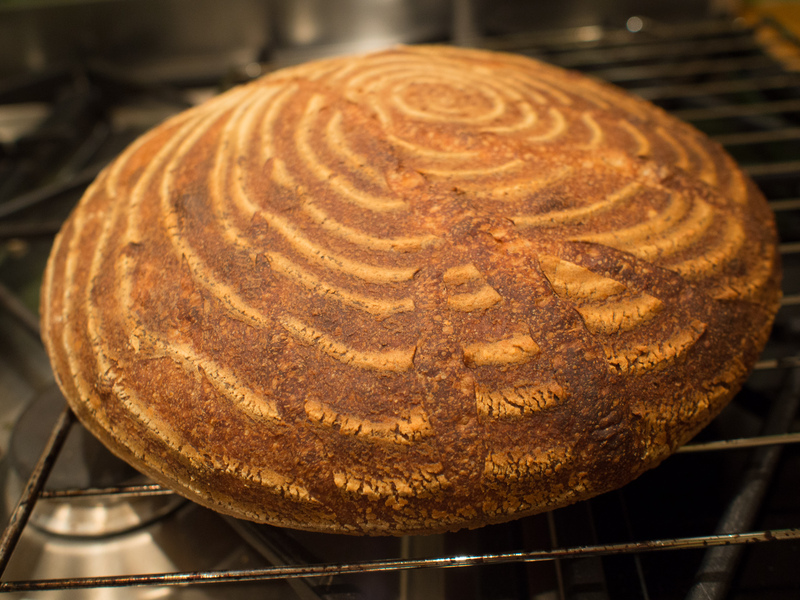 Much darker and denser – a really active, bubbling sourdough starter did cause some decent lift both while proofing and then in the oven – but a long way from the large bubbles of the first of today’s loaves. An occasional loaf, but too much for every day use. I’m buying most of my ingredients from the Daily Bread Co-operative in King’s Hedges, Cambridge – a 10-minute bike ride from both home and work. They buy in bulk, source whatever they can, locally, and provide employment for people who might otherwise struggle to find work. Prices are roughly supermarket prices. Sense of well-being from shopping there is inestimably higher.